Published 31 December 2003 in Physical Review Letters, the first study of 98 collisionless shock crossings in terms of density reveals the natural scale of the Earth's bow shock thickness. This new discovery has broad relevance to astrophysics. The thickness of the Earth's bow shock is proportional to the gyroradius of ions, according to a large set of observations from the Cluster satellites. This dataset covers a broad distribution of thickness from a few km to 400 km. Density transition from downstream to upstream. 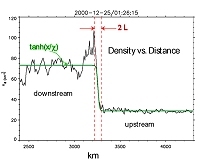 The green line is the hyperbolic tangent fit; red vertical lines show the density transition scale [Bale et al., 2003]. The thickness and the structure of the Earth's bow shock were studied before, in particular by using magnetic field data. This time, the first study of the density transition scale (top right graph) at 98 quasi-perpendicular shocks shows that the thickness of the shock is proportional to the downstream ion gyroradius. This result is in contrast with previous work based on magnetic field data. Nonstationary behavior of the terrestrial front shock as obtained from 2-D full particle simulations [Lembege, 2001]. Crossing of the terrestrial shock (magnetic field) by 4 "virtual" satellites "mimicking" the Cluster space mission in 2-D full particle simulations. The virtual satellites are coming from the solar wind (upstream) into the magnetosheath (downstream). Note the overshoot (see last image below) in the simulated magnetic field measurements. This new discovery is expected to improve the modelling of collisionless shocks (see the above two animations). "Astrophysical and heliospheric shocks are abundant sources of energetic particles and the proposed mechanisms, which are not fully understood, seem to depend on the spatial scales of the shock", explained Dr. Stuart Bale, Co-Investigator of the Electric Field and Wave (EFW) experiment and lead author on this research, published 31 December 2003 in Physical Review Letters. Shocks are indeed present in coronal, interplanetary, supernova remnants (for example the Cygnus Loop), and heliospheric media. Thus, Earth's bow shock is an ideal testbed for studying shock microphysics. Most astrophysical shocks are expected to be collisionless, so this research has broad relevance to astrophysics. Smoothed spacecraft potential measurements -ΦSC from the four Cluster spacecraft (each as a different color: black-1; red-2; green-3; purple-4) at a collisionless shock. The time shift between encounters on the 4 spacecraft is used to compute the shock normal vector and speed. Notice the coherence of the first cycle of the overshoot. This result would not have been found without using the unique multipoint measurements capability of Cluster. As explained in the December 31 paper, for each bow shock crossing, measurements of a spacecraft floating potential, on the four Cluster spacecraft, have been used as a proxy for electron plasma density. 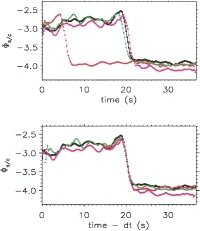 A timing analysis gives shock speed and normal (see above image); the shock speed is used to convert the temporal measurement to a spatial one. On previous missions, the density transition scale has been rarely if ever investigated primarily because particle counting instruments traditionally have required one spacecraft spin to acquire a complete distribution function measurement and spacecraft spin rates are on the order of seconds.